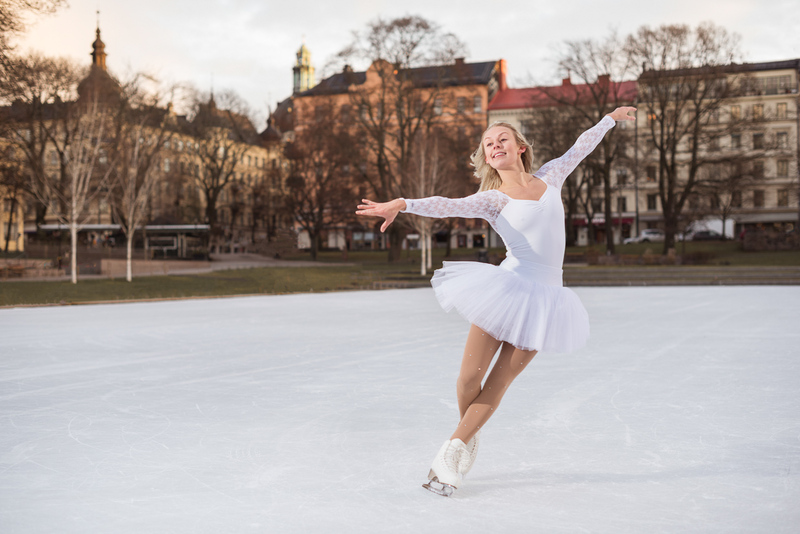 Early this morning I met up with Moa Lindgren to do a figure skating photoshoot in Vasaparken. We have had a bit of snow already this winter here in Stockholm, but it has not stayed around for long. Luckily there is a giant cooling system installed underground at Vasaparken to make sure there is fresh ice. The only person before us at the ice was the worker and we watched as he drove the machine that ploughed the ice, to make it skate-able. First test shot of the morning, trying to figure out which angles look best and what power to use for the flash I had brought along. Moa Lindgren. 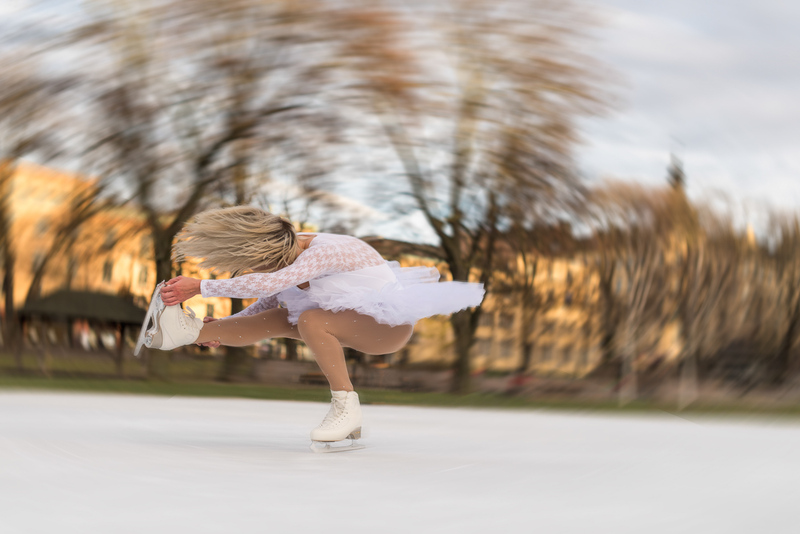 This was my first session photographing figure skating, and I liked that even static poses got a bit of motion as Moa glided towards the camera. There was a bone-chilling cold this morning, so we did three short sessions of photography, with breaks in the local seven-eleven in between to warm up. Here are some of my favourite photos from the morning. Moa Lindgren. With a short shutter time as in the previous photo you get a sharp picture frozen in time. With a longer shutter time (here 1/30s) you could capture motion while keeping Moa sharp, by panning along with the camera as you take the photo. The sun did not quite reach the ice, so to add a bit of light I used the flash that I had brought along. This meant Moa would do a wide circle, gather speed, and then gracefully skate into the photo spot. Moa Lindgren with green grass in the winter. There was quite a lot of clutter in the background that I had to clean up with Photoshop. One more photo from the same spot. We found inspiration for some of the poses from ballet instagram photos. Moa Lindgren. When we returned after our second Seven-Eleven break there were more people on the ice. Rather than just try and avoid people in the background it can sometimes add something to try and incorporate them into the picture. Moa Lindgren. When you do these types of shoots you constantly try and think of ways to create backgrounds that are nice, but ideally not cluttered. One idea we had was for me to stand on one of the side benches to get a higher point of view, and ideally have only ice in the background. Moa Lindgren. 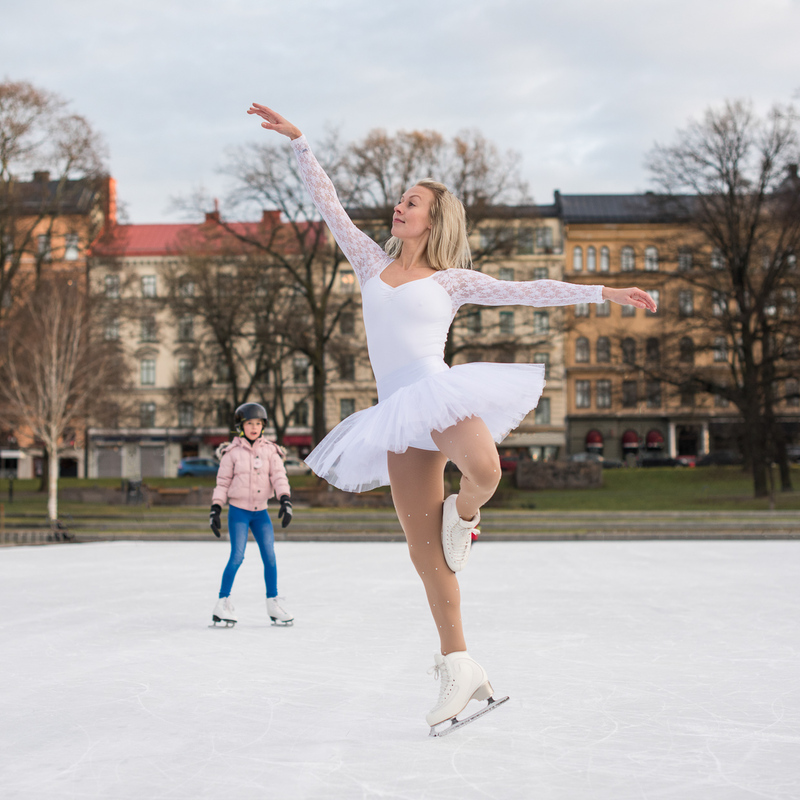 Figure skaters rotate really rapidly. Here we tried to get a sense of the speed. Moa Lindgren. Last photo of the morning. Many thanks to Moa for joining me on this crazy early and cold morning photoshoot! If you want to read more about Moa check out her blog. To see more of my dance photos, have a look at the dance category on the blog.